New York, NY – An innovative book distribution program that provides free children's books in low-income neighborhoods, combined with supportive adults who encourage reading, can boost children's literacy and learning opportunities, finds a new study by NYU Steinhardt School of Culture, Education, and Human Development. "Both physical and psychological proximity to books matter when it comes to children's early literacy skills," said Susan B. Neuman, professor of childhood and literacy education at NYU Steinhardt and the study's lead author. "Children need access to books in their neighborhoods, as well as adults who create an environment that inspires reading." Reading aloud to children has been touted by experts as a key to developing skills early in life that translate to later academic success. In fact, a 2014 position statement by the American Academy of Pediatrics called for parents to read aloud to their infants starting from birth. At the heart of these recommendations is the assumption that all children have the opportunity to learn from a selection of high quality, age-appropriate books. However, a recent NYU Steinhardt study of three major cities shows that access to books remains a significant barrier to reading with children; many poor neighborhoods were found to be "book deserts," or communities with limited to no access to children's books. Other prior research shows that creating both physical and psychological proximity to books helps get them into the hands of children. For example, creating reading corners in classrooms that are accessible and attractive encourages children to engage with books. From a psychological perspective, people help shape the setting for a child's literacy development through, for instance, reading to children or engaging them in rich dialogue around books. The current study, funded by JetBlue and published in the journal Urban Education, examines a community-wide effort to promote greater access to books through a book distribution program in neighborhoods identified as "book deserts." Four low-income neighborhoods – three in Detroit and one in Washington, D.C. – received with vending machines that dispensed free children's books over the summer months, a time when children traditionally have less access to books. The vending machines held children's books, provided by Random House Children's Books, in slots arranged by age ranges. Similar to a snack machine, an individual could review the selections, press a button, and a book would be dispensed free of charge. Book titles were selected to reflect a variety of genres, including fiction and nonfiction, as well as multicultural themes and authors. Selections changed every two weeks to encourage people to return to the machine. The study was designed to capture how, why, and in what ways these machines were used. Neuman and her coauthor, Jillian Knapczyk, used several measures to examine how greater access to books and adult support for book reading functioned within these communities. The researchers studied the vending machine sites, the traffic patterns around them, and conducted brief interviews with individuals using the machines. They also assessed children's school readiness skills before the vending machines were installed and again at the end of the summer, and had parents complete questionnaires. They sought to determine the influence of adult support on children – for instance, children who visited the vending machines with a teacher and independently visited with their parents or grandparents were identified as receiving high adult support. The researchers found that providing greater access through close physical proximity to books and greater adult support for book reading enhanced children's opportunities to learn. Throughout the summer, the vending machines were heavily used, distributing more than 64,000 books over the eight-week period – 26,200 to unique, one-time users and 38,235 to return users. Often two or three books were selected in a single visit. "Our study provides a vivid counterpoint to the view that low-income parents are less inclined and less interested in their children's early education. This study challenges that view and provides an alternative scenario, recognizing that providing access to resources — reaching families where they are — and encouraging adult support may be a key enabler toward enhancing parent engagement and children's early literacy development," Neuman said. Children who had the highest adult support – visiting a machine with both a parent and with a teacher from the childcare center – seemed to thrive and slightly gain throughout the summer. They saw a boost in their school readiness skills, and were able to recognize more book titles (suggesting greater exposure to books) than other children with less adult support. In analyzing traffic patterns, the researchers found that an average of 180 people passed by a vending machine over a two-hour period, suggesting that the machines were highly visible. Despite the sizable traffic flow, not all passersby took advantage of the machines: 60 percent used them, while 40 percent did not. Interviews revealed that those who used the machines enjoyed reading, and appreciated the opportunity to have books more accessible in the community. Parents and grandparents were highly influential in encouraging children to select books. Those who didn't select a book most often cited a lack of interest in reading. In other words, the physical proximity of books did not convert non-readers into readers, and changes in the environment alone may not be enough to motivate those who do not enjoy reading. "Our findings suggest that only having one side of the equation – access to books or adult support – is insufficient. Rather, both are necessary. Without access to books, one cannot read to children; without adult supports, children cannot be read to," said Neuman. 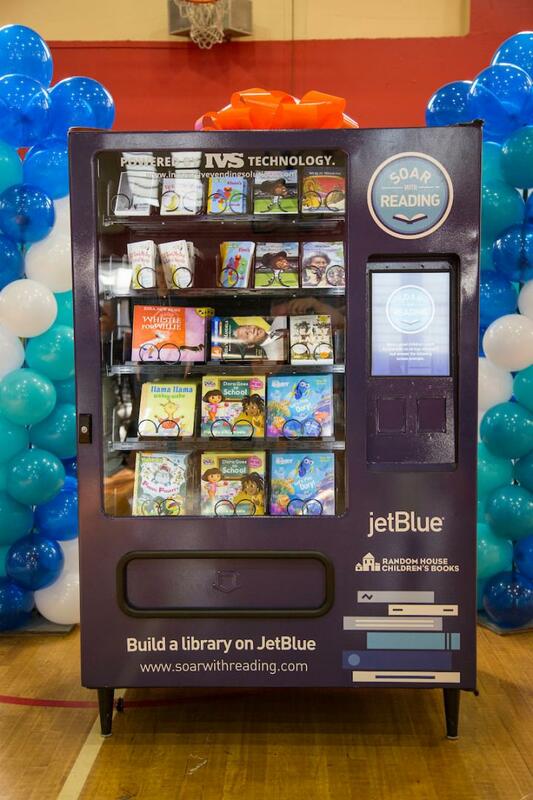 JetBlue's Soar with Reading program has donated nearly $3 million worth of books to children in need, including in the communities where this study was conducted. The full research article can be viewed here: http://journals.sagepub.com/eprint/hWhkIUpHuzUc5DTCcSj7/full. Located in the heart of New York City's Greenwich Village, New York University's Steinhardt School of Culture, Education, and Human Development prepares students for careers in the arts, education, health, media, and psychology. Since its founding in 1890, the Steinhardt School's mission has been to expand human capacity through public service, global collaboration, research, scholarship, and practice. To learn more about NYU Steinhardt, visit steinhardt.nyu.edu.